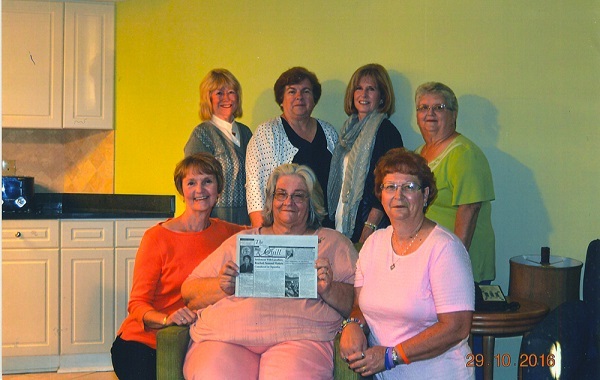 The young ladies from the Stronghurst Class of 1969 took "The Quill" along last fall to Myrtle Beach, South Carolina on a wonderful time of socializing and vacationing. from left back: Carol (Tatge) Gardioner, Diana (Keever) Stevenson, Eileen (Donaldson) Sale, Reva (Hartman) Dowell. Front row Connie (Duncan) LaRue, Adalie (Carlson) Wissler, and Ellen (Gittings) May. -When you go on a trip, take "The Quill" along, and have your picture taken with it, and send it to us. Let's see where all "The Quill" can travel.